Fresh and dried fruits offer a bright start, and this combination in full of stimulating flavours, antioxidants, and cleansing compounds. Goji berries are rich in vitamin A and help promote eye health, which is an advantage for the modern-day hunter-gatherer. 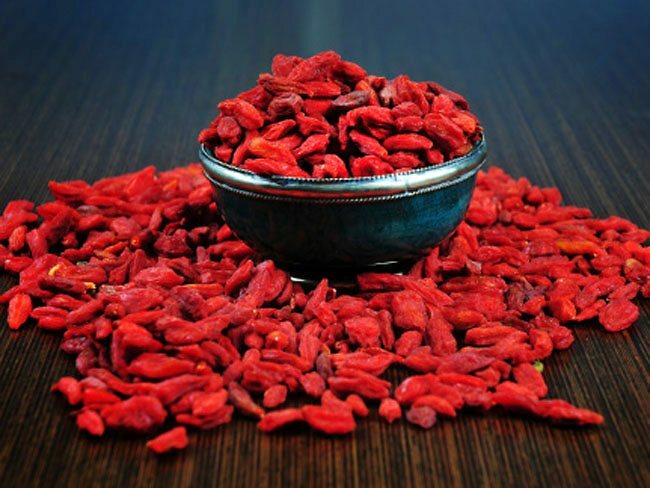 Although goji berries have only recently gained popularity in some places, they have been used as food and medicine in China and Tibet for thousands of years. The most nutritionally dense food in the world, goji berries contain all of the essential amino acids, massive amounts of iron and vitamin C, trace minerals, and antioxidants. In Chinese medicine, they’re used as a tonic for the liver, kidney, and immune system. Put the mango, papaya, pineapple, kiwifruit, goji berries, lime juice, and cardamom in a large bowl and toss gently but thoroughly. Stack the mint leaves and cut crosswise into strips about 1/4 inch wide. Fluff the strips to separate them. Put halp the mint in the bowl and toss gently. Divide the fruit among four bowls and garnish with remaining mint.